Susan Kuklin is the award-winning author and photographer of more than thirty books for children and young adults that span social issues and culture. Her photographs have appeared in Time, Newsweek, and the New York Times. Susan Kuklin lives in New York City. [A] sorely needed resource for teens and, frankly, many adults... Downright revelatory. ... Kuklin captures these teenagers not as idealized exemplars of what it “means” to be transgender but as full, complex, and imperfect human beings. As Kuklin writes, “My subjects’ willingness to brave bullying and condemnation in order to reveal their individual selves makes it impossible to be nothing less than awestruck.” She isn’t wrong. Kuklin brings her intimate, compassionate and respectful lens to the stories of six transgender young people. ... The collective portrait that emerges from these narratives and pictures is diverse, complex and occasionally self-contradictory — as any true story should be.Informative, revealing, powerful and necessary. [A] strikingly in-depth examination of the sometimes clinical complexities of being transgender, even as Kuklin’s empathy-inducing pictures put a human face on the experience. ... Kuklin’s important new book brings welcome clarity to a subject that has often been obscure and gives faces—literally and metaphorically—to a segment of the teen population that has too long been invisible. Speaking with equal impact to both the reader’s heart and mind, Beyond Magenta is highly recommended. Pain and possibility are juxtaposed in this groundbreaking book that by its very existence portends a better future. It is a testament to Susan Kuklin's gifts as a listener and interviewer that her subjects describe their lives with such candor. ... Kuklin introduces each teen with a bit of background, and often (but not always) the teen's gender at birth. Kuklin treats her subjects with tenderness and respect. Her book provides both reassurance and answers to questions that teens may not even realize they have. The presentation of the spectrum of experiences is remarkably nuanced and sensitive... Kuklin also brings her skills as a photographer to the book’s design, using some pictures documentary-style interspersed throughout an individual’s interview, others grouped as breathtaking galleries that explore expression or isolation. 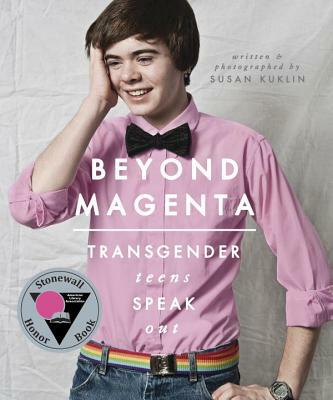 Kuklin’s book is not just a lifeline for teens who are going through something similar and need to see themselves and their lives so openly portrayed—this book is an important read for the parents, friends, and loved ones who want to understand what a transgender teen might be going through. This book is worth having on any shelf in any library and will not linger there long. ... A highly informative resource that is powerful, respectful, honest, and most importantly, long overdue. In her edited transcriptions of the interviews, Kuklin lets her subjects speak wholly for themselves... Photographs (of most of the subjects) are candid and winning; and appended material, including Kuklin’s explanation of her interview process, a Q&A with the director of a clinic for transgendered teens, and a great resource list, is valuable. This book examines a sensitive issue and explains the spectrum and diversity within the transgender community as well as defines the distinction between transgenders and individuals identified as gay, lesbian, bisexual, or queer. ... This book is a valuable resource for students desiring information on gender identity and the LGBTQ community. While several books have illuminated the lives of LGBT youth, this is the first book to focus solely on trans subjects, in an attractive collection that's perfect for a coffee table or your favorite pre-teen's bookshelf. An eye-opener. ... Through extensive interviews, Susan Kuklin has captured the thinking and personalities of each subject in this book. Her sensitive photographs shows them as interesting people who have struggled to understand themselves and how they each, in their own unique way, differ from the norm. [A] candid, inspiring book. ... The teens are members of a group, but also distinct individuals, each with a unique, highly personal story. It goes without saying that their decision to share these stories is courageous. But being brave and taking chances is what transitioning is all about.